David Gareji Monasteries and Hermitage is part of the Tentative list of Georgia in order to qualify for inclusion in the World Heritage List. The David Gareji Monasteries and Hermitage are located in the far southeast of Georgia, right on the border with Azerbaijan. There is no public transport that goes all the way there, but every day at 11 o'clock a special shuttle bus (The Gareji Line) departs from the Pushkin statue in the center of Tbilisi. This will take you to the monastery for 25 lari (8 EUR), and will return 3 hours after arrival. You cannot reserve this bus and I was afraid that it would be very busy on a Saturday when I had planned to visit. It was, but in that case they just send another bus. The drive there takes 2.5 hours, with the landscape becoming more and more beautiful along the way. At the end you’re in a vast steppe with rolling green hills and many birds. The monasteries are built against a cliff, and that gives them their special charm. In the rocks there are hundreds of natural and carved caves: they were used as monks cells, chapels and churches. The site consists of two parts: the Lavra monastery at the entrance, where a dozen or so monks live and they are busy renovating at the moment. And the Udabno monastery, at the top of the rocks. The shuttle bus is ‘transport only’, so for finding the sights we’re on our own. I started to follow an arrow marked 'Udabno' that points up from behind the monastery shop. This turned out to be a steep climb on a narrow sandy path with boulders. I gave up on that after 10 minutes. I noticed another path that runs halfway up the cliff and rises more slowly. According to the schematic map that I received from the bus company you have to be able to go up via this route as well, the paths form a loop. Walking here is a lot easier, and soon I passed a cave carved into the rocks - with a staircase cut from the rock so you can get to the entrance. Unfortunately the cave is closed by a door. It took me an hour to get to the mountain ridge. At a small chapel there I encountered a lone Georgian soldier, guarding the border. In determining the modern boundaries between Georgia and Azerbaijan, they only put a straight line on a map. That worked out unfortunate for the David Gareji monasteries: the lower half (Lavra) now lies in Georgia and the upper one (Udabno) in Azerbaijan. Walking on the mountain ridge, you're exactly on the border. The Azerbaijani border post is a long way away though and a visit to both sides of the monastery is possible without border control. After walking for 1.5 hours I still had not reached or discovered the upper monastery. And I wasn't the only one, I frequently met other tourists coming out of a cave or chapel in the hope of finding the famous murals. My suspicion is that it is located on a lower ridge on the Azerbaijan side: there you can see another series of caves, and I saw also people walking there. However, I did not want to descend anymore because you'll have to climb the same part back up again! To complete the hike I still needed to go down the steep part, back to the parking lot and the lower monastery. After finally having arrived unharmed at the bottom again, I went to see the Lavra monastery. It looked closed because of the renovation, but you can still visit the courtyard and the church. The latter appears rather new on the inside, but has been reported here since the 6th century. It contains the tomb of David Gareji, the founder of the monasteries who came along with 12 other monks from the Middle East. The courtyard has one cave where you can look inside, the others are behind closed doors. This apparently was the cell in which David lived. Unfortunately the picturesque row of cells above it is always closed to visitors. In the Lonely Planet travel guide you will find good instructions to get to the Udabno monastery. You must indeed follow the steep path to the right behind the watchtower until you reach a half-rusted railing. Below that, the path runs to the left to a ledge below, on which are the caves that form this part of the monastery. You can also get there via the long route to the left which I took (and which is less steep), but then you need - if you are as bad a climber as I am - up to 3 hours for the entire tour. 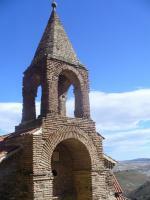 Several monasteries spread over a 30 km stretch of semi-desertic breath-taking landscape. The most famous, and easy to reach, monastery is Davitis Lavra, and the nearby cliff rock-cut chambers of Ubadno. Getting there is quite easy, either with own car or with numerous day-tours organized from Tbilissi. Public transportation is limited to the daily « gareji line» shuttle bus, which I did not experience. Google map insist to get there through Rustavi, but this road is in extremely bad condition and not signposted at all. So do take the north road passing through Sagarejo and Udabno village, which is well signposted. It takes about 2 hours. The last 6 km is on dirt road, which are however passable by regular car. The road is spectacular, with magnificiant landscape. Davitis Lavra (Saint David’s lavra) is the main monastery, nestled between rock cliffs. There is a church shop (only selling candles and icons). It is an active monastery, with two active churches in which Saint David is buried. It was founded in the 6th century, but most of the buildings, and the protective walls are later addition (17the century). Ubadno monastery (not to be confused with Ubadno village) is located on a ridge above the Lavra. I really enjoyed discovering some of the rock-cut chambers forming this complex. To get there, next to the Lavra church shop is a dirt path going up the hill. The path allows fine views over the Lavra. It can be very slipery after rain. It splits into two a few hundred meter uphill, both ways lead the top of the hill. Ubadno is on the other side of the hill edge. Technically, the edge marks the border with Azerbaidjan. There is no control, and if you enconter soldiers on the other side, there are Georgian, and here to assist tourist and insure their safety (for bad weather or paths condition, not political). The day I went, the path was extremely slippery, and the soliders were giving tourists a hand to avoid falls. The tracks lead from the edge of the hill down under a cliff, where about fifty rock-cut cave are located. On my picture, the cliff, with a few caves, and the track following the cliff). The rock-cut caves are churches, living quarters, refectories, and present with murals reprensenting kings, saints and scenary. Some go back to the 9th or 10th centuries. As there is no protections to the murals, some can be in bad condition, degradated by people. Lack of protection makes it feeling like Indiana Jones, and discovering ancient caves for the first time. It is easy to spent a long time exploring some of those caves. For some, a bit of (easy) rock-climbing is necessary. As a cocnlusion, I stongly recommend a day-trip to Davit Gareji. I believe this site has a potential. OUV is obvious to me. However, the border dispute with Azerbaidjan lessens the chance of a sucessful nomination in a near future. Davitgareja (or David Gareji ) monastery is a nice day trip from Tbilisi, if you have your own vehicle. 4WD is not a must, but can be useful, specially on the last couple of kilometers. Theoretically you can get close to the site by public transport, as there are villages on the road to the monastery, but buses are quite erratic there, and you have to get some kind of private transport for the last part of the way. Organized trips to this region are also available in Tbilisi, but, as everywhere they are highly overpriced. The road is OK up to Sagarejo, where you can see a big signpost. There turn right. On the following cca 10 km, the road is getting worse and worse. The first half is tar, but after the villages there is only a dirt road in various condition. We rented a Pajero so it meant no difficulties for us, and we have seen Russian tourists with a Lada Samara - so an urban car can do it. The landscape is astonishing - the barren semidesert of Southern Goergia, dotted with cows and sheep, witnesses of the unchanged ways of Caucasian animal husbandry in the last five thousand years. Davitgareja is the end of the road. It is a real hermitage, where almost no influence of the outside secular world disturbs the contemplation. There is no entrance fee, and one of the monks, who speaks Russian sold us a guidebook in Russian and English. We had the chance to talk to one of the novices, an interesting person with a long background in the armed forces, who now wants to devout all his life to God. Ha told us, that there are less than ten monks and twice as much novices living actually in the monastery. 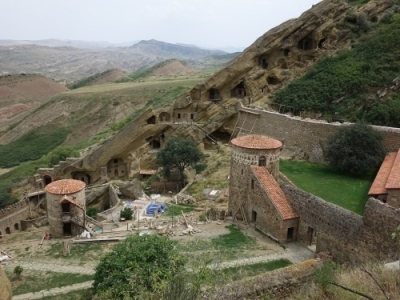 The monastery consists of several buildings and cave cells. Those cells, that are inhabited ar closed for the visitors, in the other parts you can walk around. A brief description on what you can see there is in the documentation of the State party. "The foundation of monastic centre in the first half of 6th century in the Gareji desert is connected with the name of one of the 13 Assyrian Fathers, St. David named Garejeli and his disciples Lukiane, Dodo and others. Along with the Lavra founded by St. David Garejeli, they laid the foundation of the monasteries of Virgin (Dodos Rka) and St. John the Baptist (Natlismtsemeli). 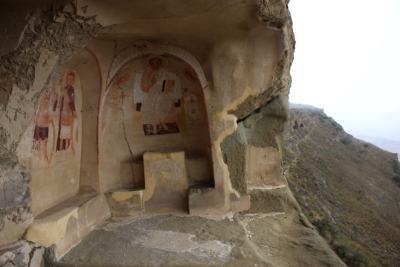 In Medieval times, Gareji desert with its rock-cut monasteries and magnificent murals containing the portraits of Georgian Kings, served as one of the most important monastic and pilgrimage centres of Georgia. It was a Royal monastery with a primary and figurative meaning. The Kings themselves patronised and took care of it. In addition to churches, chapels and cells, there were numerous caves at Gareji for practical, everyday purposes; caves which served as barns, bakeries, smithies and housing for livestock. Terraces were constructed for agricultural purposes. Some unique mural paintings are preserved in the Gareji monasteries, the oldest of which go back to the 8th century. Analysis of the surviving remains leads to the conclusion that till the end of the 10th century they only partially painted the interiors of Churches: usually just the apse and dome, but sometimes the northern wall as well. The most ancient mural paintings are found in the Dodos Rka Monastery, on an apse of one of the small Churches. Mural paintings of the 10th century are to be found in the Tsamebuli and Udabno Monasteries. The period between the end of 10th to the beginning of 13th centuries was a golden age of Gareji monasteries. The Gareji School of painting developed in this period. One of the main features of this School is the representation of episodes from the life of St. David Garejeli in addition to the canonical scenes. The oldest example is to be found in the first layer of paintings of the main Church chapel of the Udabno Monastery. Another feature of the Gareji school of painting is an abundance of contemporary and realistic portraits of Royal personages. In some cases, they are the only images to have survived. The turn of the 12th and 13th centuries witnessed the creation of the mural paintings of Bertubani Monastery, the finest achievement of the Gareji School. They are very impressive free style works and are distinguished by complete renditions of Life of the Virgin Mary."